The Klein VDV226-011-SEN Ratcheting Modular Crimper/Stripper is durably made from steel and finished in black oxide for high performance. It helps provide fast, reliable modular-crimp connector installation for voice- and data applications. Other features include: Cuts, strips and crimps paired-conductor cables (round STP/UTP and flat-satin phone cables); Crimps 4-, 6- and 8-position modular connectors (RJ22, RJ11/RJ12 and RJ45); Designed for Western Electric (WE)/Stewart Stamping (SS)-type modular connectors. Dimensions: 4-Inch x 7.5-Inch x 0.9-Inch. 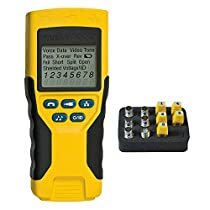 Klein Tools offers a comprehensive line of verification VDV products created to prep, connect, and test network, phone, CATV, home theater, satellite, and security cables for residential or commercial systems. Since 1857, the company operated by Mathias Klein and his descendants to the fifth generation, has grown and developed along with the telecommunications and electrical industries where Klein pliers first found major usages. Today, Klein Tools Inc represents much more than Klein pliers. The company's product line has broadened to include virtually every major type of hand tool used in construction, electronics, mining and general industry in addition to the electrical and telecommunications fields. Internationally, Klein's products are available around the world through a well-established network of agents and distributors who stock the products that are required for their particular markets. Klein's reputation as a leading producer of professional-quality products is global. 89 of 94 people found the following review helpful. Reliable tool, well designed for the job it performs. I've never had a problem with a cable I made. I would give it 5 stars except for two things that I would put in the design if I built it. 1) I wish it could stay in the fully closed position. It will stay in the last click before closing all the way, but once it makes the final click it opens. I know this is necessary when you're actually crimping a cable, but to have a mechanism to keep it closed for storage in my bag would just be nice to have. 2) I wish it were 1/2" shorter. Skip this part if you don't want to read a rant. I hate the TSA. They do a great job of keeping everyone safe by making sure the airports can charge $3 for 16oz bottle of water, helping toiletries manufacturers charge 2-3 times their normal prices for small quantities of product, and hassling tradesmen who travel frequently by making them deal with checking bags to bring their tools to a job site. TSA has an asinine requirement that tools cannot exceed 7" in length. This tool comes in at just under 7.5", meaning that the TSA can and will hassle you for it if they are bored. In recent months I took the tool with me on 4-5 trips through airports around the country. Then, on my way home from Greenville, SC (for the second time in 3 weeks) an agent felt it necessary to keep America safe by keeping me from flying with it in my backpack. It was about 2 minutes before she got off shift, so I guess she needed to do her good deed for the day by making me check my bag even though Chicago, Dallas, New Orleans, Baton Rouge, Albuquerque, Philadelphia, Boston, and even Greenville previously gave me no problem before. TSA's restrictions are totally arbitrary and do little to nothing to actually keep passengers safe. Bought these based on Klein's good reputation after having suffered the poor performance of a cheap crimp tool that came with an all-in-one cable kit. The kit was a big mistake, as everything in it was "cost effective" to the point of being useless. At any rate, the Klein crimper is impressive right out of the package. It's heavy construction is matched by solid performance. I've used a few different crimpers (not a bunch) recently, and this tool is my favorite. It's only fair to point out that I don't use this tool for scoring insulation on cables. Nothing seems to work as well for me as a plain old sharp hobby blade, and that's what I'm sticking with. What the Klein tool gives me is a solid electrical connection and a good "bite" on the cable without distorting the plastic connector. I'm quite happy with this tool. Works well, worth the price. Pretty nice set of crimpers, and much more pleasant to use than the cheap non-ratcheting ones. It will do 8P8C, 6P6C, and 4P4C, strip the jacket from round Cat3/5/6, and strip some types of flat phone wire. (I had mixed results on flat phone wire and found it easier just to use a utility knife, but it depends on the wire -- but really, how much flat phone wire do you use anymore.) It produced good crimps with the two brands of 8P8C and one brand of 6P6C jacks I tried. No real negatives, except that the tool lacks any sort of latch to keep it closed. Maybe that is intentional, to protect the spring, but it makes it take up a bit more room in the toolbag or box than it would closed.